The Peak Park Preserved Bus Gathering takes place at Rowsley South Station, which is situated on the preserved ‘Peak Rail’ line between Bakewell and Matlock in the Derbyshire Peak District. 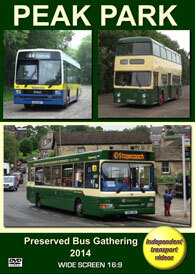 Apart from the displays of preserved buses and coaches they also run four bus services to Bakewell, Chatsworth House, Darley Dale Station and Matlock. The event is organised by the ‘Chesterfield 123 Preservation Group’ and ‘Transpire’, the Chesterfield Bus Society. This is an annual event, but the first time that the independent transport videos cameras have attended. In our time-honoured style, our cameras were on hand at the start of the day to see most of the arrivals entering the site to either take up their position for display or for service. Our next location is in the delightful market town square of Bakewell. The town is noted for its ‘Bakewell Puddings’, and the famous shop that sells these delights can be seen behind the buses as they pass by! Apart from the preserved buses we also film a couple of former Dublin Bus Olympians operating for TM Travel on the busy and frequent trunk route 215 that runs between Sheffield and Matlock. Our cameras return to Rowsley South Station on a former Blackpool Transport East Lancs bodied Leyland Atlantean, number 353 (UHG 353Y). After filming some more action at Rowsley we board Alexander bodied Leyland Leopard, 306 (PRA 109R) in the smart yellow, white and blue livery of Whites of Calver for a ride to Chatsworth House. This magnificent house and grounds gives us a splendid backdrop as we record another TM Travel Olympian and the arrival of our transport back to Rowsley - former Crosville Bristol Lodekka FS, DFG157 (4227 FM). As we ride back to Rowsley on the Lodekka we pass other preserved buses operating on the bus services. Our cameras were on hand to record the final departures from the site as the display vehicles leave for home. Thus completing a most enjoyable day with lots of action for you to enjoy and a lasting memory of the day if you were there and if you weren’t, just see what you have missed! To complete our programme we have a short cine film from our own archives of Chesterfield Corporation buses in action in the late 1960s, including a former London Transport RW class, Willowbrook bodied AEC Reliance. Enjoy! Duration : 54 minutes (approx).